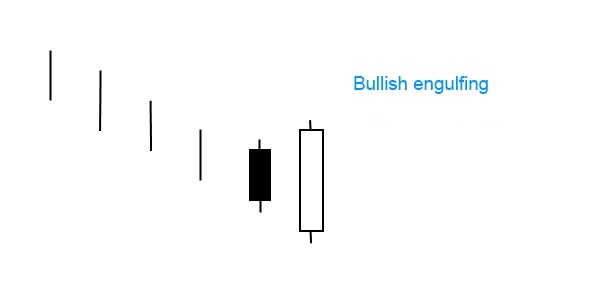 The bullish engulfing is a two candle pattern, in which the black candle’s body of the first line is engulfed or covered by the white candle’s body of the second line. The first line can be any black basic candle, appearing both as a long or a short line. It can even be a doji (except for the four price doji). What happens when a bullsih engulfing pattern forms? The signal day opens lower than the preceding day’s close. Then it trades higher, so by the end of the day it will close above the previous days open. This shows a change in sentiment, from a gap down in the morning to a strong price escalation during the day that forms a large bullish candle. The bulls are in control and it seems that a reversal is on the horizon. The engulfing candlestick patterns – both bullish and bearish engulfing – are one of the easiest to identify. An engulfing candlestick pattern usually appears near the tops and bottoms.